Living with persistent joint or muscle pain? Try restoring the natural synovial fluid between the joints with Hyaluronic Acid (HA) supplements. Contains 40 mgs of Hyaluronic Acid. IVL products contain only natural, beneficial ingredients that really work to improve wellness. Hyaluronic Acid (HA) supplements shown improvement of joint mobility as well adding moisture to the skin. 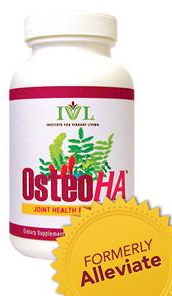 OsteoHA Joint Formal has 12 times more HA then similar products like Schiff's Move Free Ultra. Taking oral HA supplements is less invasive painful injections. Just say no to needles! This product is all natural and "grown with ecologically friendly cultivation methods" which means no GMO raw materials. White willow bark is known to work like aspirin to relieve pain without the negative side effects of nonsteroidal anti-inflammatory drugs (NSAIDs). Also white willow bark contains tannins that are actually good for your digestive tract. Ginger has been used in Indian Ayurvedic, Chinese, and Japanese medicine for hundreds of years as a natural way to decreases arthritis joint pain and inflammation. OsteoHA doesn't have glucosamine so people with allergic reactions to shellfish can take it. In fact, no OsteoHA ingredients come from the ocean. IVL's product advertisements have many reviewers stating with OsteoHA they were able to cancel knee surgery. HA supplements may have absorption issues; however is less invasive then an injection directly into the joint. White willow bark contains salicin, so people who are allergic aspirin should not this product. It may take up to 6 to 8 weeks to see results. People on blood thinners should consult their doctor before taking ginger as since it may increase the risk of bleeding. I think adding turmeric to the line up of herbal solutions would have been ideal. OsteoHA is not available at local retailers and must be ordered online.